Americans aren’t being allowed to see what’s in ObamaTrade. In fact, the agreements that lawmakers are supposed to vote on next week are so secret that lawmakers aren’t even allowed to keep any notes they make about what the deals contain. But that wall of secrecy is being pulled down. WikiLeaks is conducting a campaign to expose all the ObamaTrade documents. That effort is already paying off for curious voters. WikiLeaks has uncovered and published 17 documents on what is being referred to as the “big brother” of the highly secretive Trans-Pacific Partnership (TPP): the Trade in Services Agreement (TiSA). Where the TPP covers 12 countries that account for roughly 40 percent of the world’s GDP, according to the Office of United States Trade Representative, the TiSA extends its reach to the United States, the European Union, and 23 other countries that cover two-thirds of the world’s GDP. The deal does prominently exclude the BRICS countries—Brazil, Russia, India, China and South Africa. And like its little brother, the TPP, details of the TiSA have been shrouded in an unprecedented level of secrecy not only by the Obama administration (the self proclaimed “most transparent administration in history”) but also by other governments. “Services,” as noted by WikiLeaks, account for the vast majority of the economies of the United States, European Union, and even developing nations. The 17 documents that were published on Wednesday outline drafts of the secret bargaining on topics such as Air and Maritime services, Transparency, Electronic Commerce, and Financial Services. The primary aim of the TiSA is to increase corporate profit through the deregulation of services around the globe that would limit a government’s regulation in the public interest. 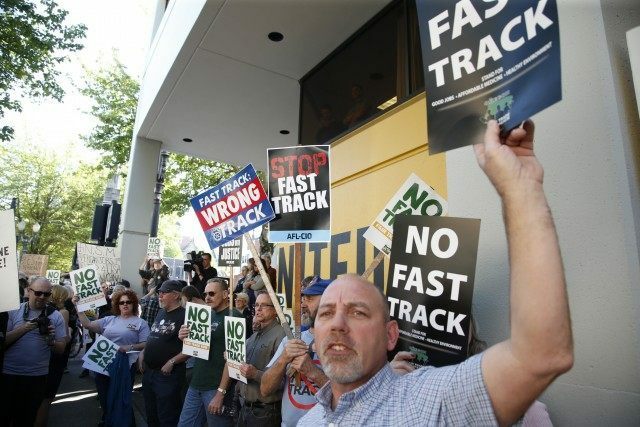 And like the Trans-Pacific Partnership, the Trade in Services Agreement could be fast-tracked through Congress through Trade Promotion Authority that would ban Congress from making amendments to trade deals and only allowing for an approval or disapproval vote. The cover sheet of the leaked TiSA documents records that the text of the deal should not be de-classified until five years after negotiations are closed and the regulations implemented to extend the extraordinary secrecy of what the deal entails. The secrecy of the deal is designed to be a buffer between legislatures and citizens alike to suppress government accountability and explicitly goes against the foundation of a democratic society. Through all of the uncertainty surrounding these major international trade and service agreements, there remains one well-founded clarity: without WikiLeaks publishing details of the treaties, the text would not have been unsealed until after the deals were finalized. At which point, citizen and legislative action would come far too late to call for change.